One Big Yodel: What does someone in Trumpland think of Switzerland? What does someone in Trumpland think of Switzerland? What does an American, specifically you, think of Switzerland? That was the assignment The Frau received from an editor at Die Zeit a few weeks ago. Her answer, in essay format, was published today in the Swiss edition of the German-language weekly. 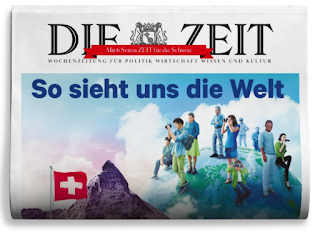 This week's issue explores how various nationalities see Switzerland. A smart idea and The Frau looks forward to reading what others authors think too. However. What would be even more interesting, at this point in time, is an American magazine that did an issue about what the rest of the world thinks of the United States. That we're gullible? That we're ignorant? That we're a bad reality show with too much reality to even digest anymore? That we're going to ruin their lives too? What does The Frau think about America? Well, let's just say it's not good. But she is no longer speechless. Instead of just sitting there, sick to her stomach in her pajamas until 4 p.m. on a Wednesday, she is speaking up, both in written and verbal formats. Yodelers, she is determined to save her country and use her Swiss wisdom and international viewpoints to do so. 1. Writing essays and articles that push progressive ideas (you know, those oh-so “radical” Swiss ideas, like universal healthcare, paid parental leave, etc.) ideally for publication in high circulation places. 2. Continuing to write the sequel to Swiss Life, which is titled, American Life: 30 Things I Wish I’d Known. The book suddenly became an even more interesting project on November 9. 3. Participating on her local citizen’s council, which slates candidates who seek office in her suburban town. 4. Giving back creatively to any potential progressive candidate who may need some advertising or copywriting assistance. 5. Continuing to consider moving back to Switzerland, especially if the SVP goes away. What do you think of Switzerland? Of the United States? Can the United States be saved? How? Too many people like you look at just social issues, and not at economic issues. Have you ever considered that fixing economic ills could help alleviate social issues? That economic ills contribute to social issues? I am a social liberal and fiscal conservative. When people are not struggling financially they probably have less angst in general and less time to dwell on things that annoy them about other people. Conservative political parties such as the SVP are picking up in Europe, for a reason. We're also not anti-immigration. We only want people to immigrate legally. Bleeding-heart liberals call illegal immigrants "undocumented immigrants" and act like being in the USA is an entitlement for all those who came illegally. How would that go over in Switzerland if the same happened there? How do you think the Swiss government would deal with the same thing? The service sector in the USA hires illegal immigrants which pushes wages down, and on top of that so much of the compensation there is in cash, which leads to many not paying tax on that income. Even though they use our healthcare system and schools. If you think that Trump is terrible and Clinton or Sanders would have been appreciably "better," you're delusional. I look forward to reading your sequel to Swiss Life. Living abroad really can change your perspective on your own country. I've been dealing with that for a long time. And I agree with you on the SVP. Towering over the Moselle valley in upper east France are two rusting demonstrations of the dashed any expectations of Francois Hollande's administration that pose a potential threat over the decision of his successor one year from now. A real non-bot non spammer here! The brave "anonymous" who says he/she is a social liberal and fiscal conservative thinks that's very original of him or her, I'm sure. It's a yawner of a cliche, indulged in by people who want to do what they want to do and don't want to share with others. So. You might mention that women in Switzerland get pensions to compensate them for their years of child rearing. The Swiss acknowledge the importance of bringing up children and realize that women can get behind in careers and income because of child rearing duties. I get almost as much as my husband in Swiss SS. As long as I fill out a form each year stating that I am still alive, I get that monthly check. Excessively numerous individuals like you take a gander at simply social issues, and not at monetary issues. I am a social liberal and monetary preservationist. At the point when individuals are not battling fiscally they Want to Write My Research Paper presumably have less tension by and large and less time to harp on things that irritate them about other individuals. I once in a while think about whether he is still in contact with the lady he duped with in light of the fact that he needs to experience the town that she lives in twice every week. thesisassistnce.co.uk is a writing site you can trust.